These fish are among the survivors of 131,000 yearling Chinook released into the North Fork in 2016. That was before two new fish hatcheries were constructed as part of a wide-ranging legal settlement that cleared the way for a new federal hydropower license for the Tacoma-owned dams. The dams, built in the 1920s, blocked fish passage until recently, when new facilities were built for trapping and moving fish past the dams. For background, see Water Ways, Jan. 13, 2009. Before the dams were built, the Skokomish River supported a variety of Chinook salmon runs, including both spring and summer Chinook in the North Fork. Some of the most productive habitat was inundated by Lake Cushman above the upper dam, but the dams were not the only problem facing salmon in the watershed. After the dams were built, a small number of spring Chinook continued to spawn in the North Fork below the dams during years when flows were adequate. But official documents from the early 1990s calls the spring Chinook extinct. Eggs for the new run of spring Chinook came from fish returning to the Marblemount Hatchery, located on a tributary of the Skagit River in North Puget Sound. They were reared for a year at the Lilliwaup Hatchery on Hood Canal before their release into the North Fork. That hatchery is managed by the group Long Live the Kings. Biologists reported the first of the adult spring Chinook swimming up the North Fork in June, a few weeks later than their counterparts returning to the Skagit, Andy said. These fish had farther to go to reach the southern end of Hood Canal, he said, but they should be ready for spawning in about two weeks — on schedule with those returning to Marblemount. He said the fish appeared sleeker, somewhat like a torpedo, as opposed to the rounder-looking fall Chinook that return to other hatcheries in the area. “We don’t know how long the run will last,” Andy said, but hatchery managers will take steps to keep the early Chinook separated from a fall hatchery stock in the Skokomish. This year’s spring Chinook returns to the North Fork will be used to collect eggs for the next generation to be reared at the new hatchery. More eggs will be needed from Marblemount until enough fish return to the North Fork to provide about 450,000 eggs each year. That will typically require about 100 females, Andy said. If things go well, some of the spring Chinook returning to the Skokomish will eventually be released above the dams to spawn in the upper North Fork, where pristine habitat awaits them in Olympic National Park. This stock could also be used to rebuild a run of spring Chinook in the South Fork. Details are yet to be worked out in consideration of habitat quality and genetic consequences for fish that would spawn naturally. Some of the Chinook returning this year could be 3-year-old “jacks” released in 2017. That year, 400,000 eggs were started at Lilliwaup before the newly hatched fish were transferred to tanks at the new hatchery for rearing. Since then, eggs from Marblemount have been taken directly to the new North Fork hatchery. Further testing is expected to reveal how many jacks arrived this year among the first spring Chinook run in modern times. Andy said excitement is running high as people recognize the start of the new salmon run, which is expected to evolve more localized traits based on conditions in Hood Canal. 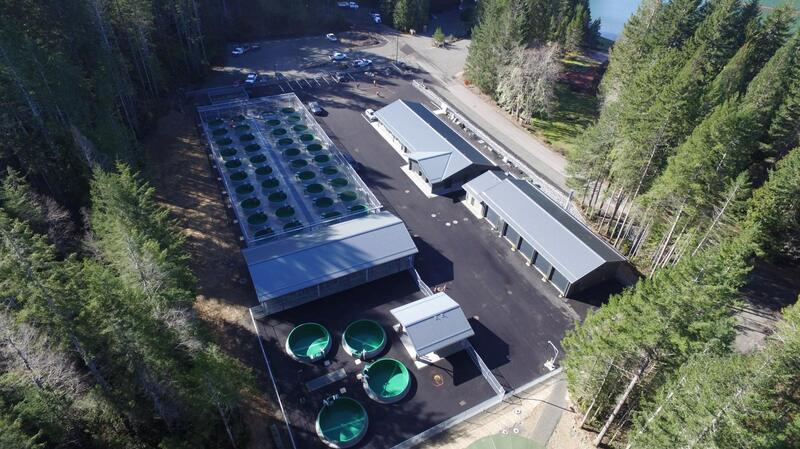 The new hatchery also is being used to supplement existing stocks of coho salmon and steelhead trout surviving in the Skokomish River system. A second new hatchery has been built at Saltwater Park on the shore of Hood Canal near Hoodsport. The goal is to restore a run of sockeye salmon — a species that migrated in and out of a much smaller Lake Cushman before the dams were built. The new sockeye hatchery is receiving eggs from the Baker Lake Hatchery, located on a tributary of the Skagit River in North Puget Sound. After hatching, the sockeye fry are placed in Lake Cushman, where they will grow until they begin their migration downstream. A collection facility on the lake uses flowing water to attract the downstream migrants, which are then moved past the dams. I wrote about the sockeye restoration for the Kitsap Sun in July 2014. For additional details about the two hatcheries, check out the article and photos by the National Hydropower Association. Additional information can be found on the website of Cushman Fisheries Program.